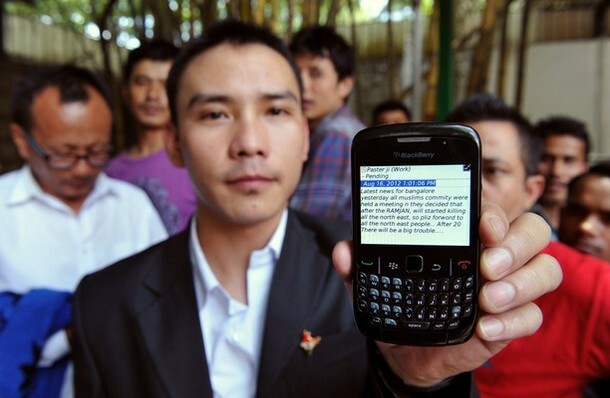 Bangalore, Aug 26 : The man who stands accused sent a jaw-dropping 8,000 threat SMSes and caused last week’s exodus of north-easterners from Bengaluru has been arrested. Police said Moosa, 28, who they picked up from Kalasipalya (in Bangalore) on Saturday evening, could well have been the mastermind behind the terror-inducing text campaign, but are not ruling out the possibility that someone else might have directed him. Moosa’s arrest comes a week after police arrested Anees Pasha, 26, for the same offence and who spilled the beans on the former during interrogation. Two of Pasha’s associates also reportedly mentioned Moosa, who was tracked down through his mobile phone. All the arrested men are close friends and acted in tandem to send the thousands of messages that created chaos in the city, say the police who have registered cases against Pasha, Thaseen Nawaz (32) and Shahid Salman Khan (22) for promoting enmity between groups, deliberate and malicious acts and also under section 66 of the Information Technology Act. Police are yet to nab 15 more of Pasha’s friends who are said to have fled the city and have switched off their cellphones. Interestingly, police said, Pasha has a Facebook profile that is filled with lies — that he did his schooling in Delhi and went to college in California, US, when in fact he is a school dropout. Pasha and his friends, who had started a mobile phone repair business, had a marketing website called fone-wala.com.